Press the sauté button on the Instant Pot, adjust the heat to the highest setting, then add the oil to the pot. Wait for the oil to get hot, then add the onions. Cook the onions for 15-20 minutes, stirring occasionally, until browned (keep the stirring to a minimum in the beginning to brown the onions faster. As the onions brown, stir more frequently). Add the garlic and ginger and stir-fry for 1-2 minutes. Add the tomatoes and cook for another 3-5 minutes or until the tomatoes cook down a bit. Stir the bottom of the pot to scrape off any brown bits. Add the spices, give everything a good stir, then secure the lid, close the pressure valve and cook for 5 minutes at high pressure. Blend the masala using a blender or an immersion blender (it can be smooth or slightly chunky – up to you!). The sauce will continue to thicken a bit as it cools. Once the masala is cool, I store it using this silicone mold which holds 1/4 cup of onion masala per mold. You can read this blog post to learn more about how to store and use this masala then go check out all of my onion masala recipes! There is no need to add additional water to this recipe as the onions and tomatoes release enough water. Getting a burn error? I’ve made this masala many times in my 6 quart Instant Pot and have never gotten a burn error however some of you have mentioned having this issue and my suggestion is to make sure you are using enough oil so that the onions don’t stick to the bottom of the pot! Also, if there is anything stuck to the bottom, you can add a bit of water to help deglaze the pot. Make sure to remove any burnt bits before securing the lid! If there’s something stuck to the bottom, then you may get the burn error but chances are that if it comes to pressure, it’ll be fine once you open the pot. Some appliances/models may be more sensitive. If it’s not tomato season, use canned diced tomatoes (the whole contents of the can) for the best flavor. If using fresh tomatoes, I suggest using roma tomatoes because they have less water content compared to other tomatoes. This results in a thicker masala. If using different tomatoes, you will likely need to boil off water at the end. Make sure to adjust the temperature to sauté at the highest setting when sautéing the onions. It is up to you as to how brown you would like the onions. I have skipped fully browning them before and the masala still turns out well. The more caramelized the onions, the sweeter the masala will be. You can also make this masala without the ginger, garlic and spices if you prefer. Just be sure to keep that in mind when preparing meals. Learn how to store this masala by reading this blog post. You will want to make sure the onion masala is cold before putting it in the freezer. I store it in the fridge first, then once it’s cold I put it in the freezer. This helps to reduce freezer burn. 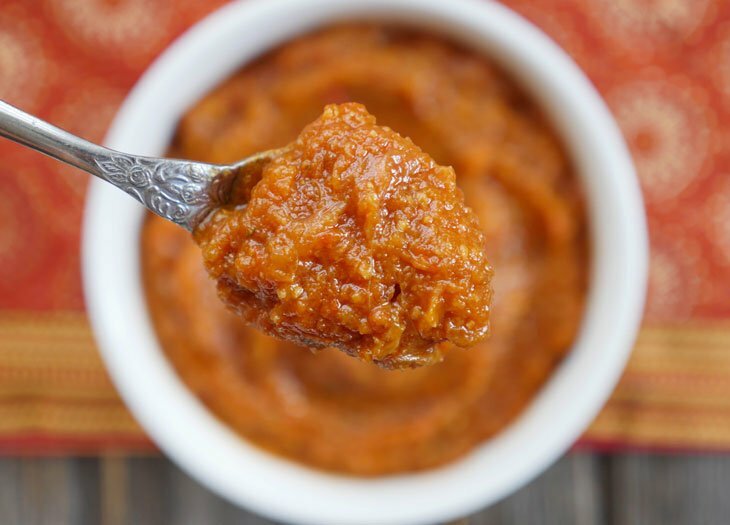 Check out my onion masala series to learn how to use this magical sauce!